Someone just arose from the dead of shame (of not blogging for who knows how long)! The reason for that dreadful act is unmentionable since who wants to hear excuses. Right? But the most important thing is that I brought a delightfully sinful double chocolate cake that can be made without any fancy kitchen tools. I'd know that because I have no proper kitchen tools anymore. And guess what! This Hungarian girl is living in Indonesia for quite a while. Now you can guess one of the excuses I'd be listing up for my disappearance act. What I have here is a miniature kitchen with basic kitchen utensils and an adorably petit oven that doesn't heat up more than 190C. But hey, use what you have and that's what I'm doing! Nothing is impossible, I proudly declare! Why is this chocolate cake different than your go-to choc cake? Well, because it has a flavorful, far from dry, gooey-ish cake base with a wonderful super chocolatey frosting that even I couldn't mess up! And I am a notorious frosting destroyer. Add some white chocolate stripes on top and voila, chocolate explosion! It is wonderful. Okay, I won't keep you from the recipe any longer. Go ahead, just try it! Note: The batter will be super runny. Don't concern yourself with it, it will turn out beautifully! First off, pre-heat your oven to 175C or (350F) and grease your baking pan. I also placed parchment paper in the pan. Then, mix your dry ingredients (flour, sugar, cocoa powder, baking soda and salt) together. Add in the eggs, one at a time, buttermilk and coconut oil and stir vigorously if you only use a wooden spoon (like I did), or use your mixer. When the batter is smooth, add in the coffee and mix it well. The runniness shouldn't bother you, just pour half of the batter in your pan and let it bake for around 40-45 minutes. Depending on your oven, check it with a tooth pick after 40 minutes. Let it cool for 15-20 minutes and run a knife around the edges and carefully take the cake out of the pan. Let it cool on wiring racks. Use the same method for the other half of the batter. Melt the chocolate in a bowl set over a saucepan with simmering water. Once melted, let it cool to room temperature. Make sure your butter/margarine is soft, not melted, and combine it with the sugar and salt and cream it with a wooden spoon. Incorporate the whipping cream and the cooled chocolate and mix it until well combined. Spread frosting on one of the cakes. Apply it evenly and generously. Carefully, place the other cake on top. Start coating the cake with the rest of the frosting with a cake spatula. Once all your frosting is on the cake, take a white chocolate bar out of the fridge. It's important to have cold chocolate on hand and using a big knife, start shaving the chocolate by scraping the chocolate with the blade towards you. This motion will result in pretty chocolate curls. Place them on your cake in any shape you desire. Once the chocolate curls are on your cake, and you want to add more decoration, melt the rest of the white chocolate with 1 tablespoon of coconut oil and put them in a pipe, cut off one of the corners and release the chocolate randomly over your cake. I'm in an everlasting battle of craving cookies and wanting skinnier hips. While on weekdays the skinny hips do sound much much better, on the lazy weekends when all I do is chill out, cookies just win. Even though, I try to contain myself so I don't eat the entire batch in one sitting, I am still a cookie fanatic. And as a fanatic, I am incredibly picky when it comes to my cookies! I mean, if you're already giving in the temptation and the desire to have smaller thighs, then at least sin with something that's worth sinning! So when I want to eat the little sugar bombs, I have specific expectations. First of all, I want my cookies to be crunchy. I want crumbles when I bite into one, I want the exciting texture that makes crunchy on the outside, chewy on the inside cookies. I want toasted walnuts, I want the richness that the chocolate chunks add, I want a bit saltiness and most of all, I want that after I finish it, I feel absolute contentness. And that is exactly what this recipe gives you. I altered the original recipe a bit, as I added a bit less butter, I also browned it for an even richer taste, less sugar, more salt and voila; awesome cookies!! They got a bit darker in color but that's due to my horrible impatience. I just couldn't wait for the butter to cool down and I mixed in the warm butter with all the other ingredients and thus the chocolate melted a bit. Oh well! But if you like paler ones, just be patient and wait until the butter completely cools down or if you want even better texture, just put it in the fridge and wait until it solidifies again. Hope you'll love them as much as we do! In a medium saucepan, melt the butter. When it's completely melted, just keep the heat on, it will bubble up but just keep on cooking it over low-medium heat. It will have a foam on top but don't worry just keep stirring and cooking. When the foam starts to evaporate, pay attention because from here, the butter browns quickly and can burn if you leave it on too long. So when you see brown specks at the bottom of the pan, then it's ready. Cool the butter down, you can also place it in the fridge after it cooled so it becomes solid again. After it's cool or solid, add in the sugars. Then the egg and the egg yolk. In a different bowl, mix the flour, oats, baking soda, salt and cinnamon together. Incorporate the dry ingredients to the butter mixture. Add in the chocolates and the walnuts. Form small balls with your hands and place them on a baking sheet, leaving some space for them to grow as they bake. Bake them for 13 minutes on 175C. I have a love and hate relationship with croissants. Creating them, I mean. Because unless you have tried to make them yourself, it's impossible to even imagine the amount of work that is behind these lovely crescents. First of all, you need excellent ingredients. Butter. Flour. These are the most important components to croissants. Buy good quality, it's worth the investment. Second of all, find a good recipe. Well, I help you with this one ;) I have found an amazing recipe! I've tried so so so so many of them that might have worked for some, but they never did for me. I never got the buttery, crunchy outside- pillow-soft inside pastry that I was looking for. But this recipe got the magic! It really does! I also made them insanely sinful! Stuffed most of them with the smooth, wonderful Nutella. Oh my, they were just downright the closest thing to get to heaven while sinning. So if you've got a day when you have nothing better to do, then make it a croissant day! I will link the recipe that will provide you amazing gif.s that help tons to replicate the perfect consistency! 1 cup+2 Tbsp butter (250 gr) - frozen, and left at room temperature for 30 min. In a small bowl, mix together the milk, boiling water, sugar and yeast. Cover it and let it sit for 5 minutes until it becoms frothy.If it's not frothy, you might have to heat it in the microwave for a few seconds. In a big bowl, measure out the flour, salt and pour the frothy yeasty milk mixture on it. Incorporate it with your hands into a ball. Knead the dough until it incorporated all the flour. Place the dough into an oiled bowl and let it chill in teh fridge for an hour. When your dough has been in the fridge for 30 min, grate your cold butter onto a piece of plastic wrap. Flatten and shape the grated butter (will look like grated cheese) into a rectangle, about 12cmX20cm in size. Fold the wrap around it tightly. Chill in the fridge for 30 min. When your dough has been in the fridge for an hour, take it out and roll it on a floured surface to a 25cmX40cm rectangle. Unwrap the butter and place into the center of the dough. The butter's longer side should be almost the same size as the dough's shorter side. Fold the dough into thirds over the butter, like a business letter. Seal all the edges by pinching the dough together. Rotate the dough 90degrees and using the rolling pin to make regular indentations in the dough (this will help to incorporate the butter in the dough). Roll it into a rectangle again. Fold it into thirds like a business letter and wrap it in plastic and put it in the fridge for an hour. Remove from the fridge after an hour and do the same rolling and folding as you did before. Put it back in the fridge for an hour. Repeat this 2 more times, so 4 folds all together. Cut the dough into quarters and refridgerate the dough for 8 hours. Take out one piece of dough. Put it on a lightly floured surface and roll it to a 15cmX25 rectangle. Cut into thirds, forming 3 smaller rectangles. Cut each of the rectangles half diagonally, forming 6 triangles. Take one triangle and pull on the corners of the shortest edge, to even up the base of the triangle. Then gently stretch the dough a little and cut a small slit in the base of the triangle, stretch it, then roll the dough up. If you want to fill it with nutella. Place a teaspoon of Nutella at the bottom of the triangle and then roll it up. Place it on a cookie sheet and do the same with the rest of the dough. Cover them loosely with a plastic wrap and let them rise on room temp. for 2 hours. Once ready to bake, preheat the oven to 450 degrees F (22o degrees C) . Brush the croissants with beaten egg using a pastry brush and put into the oven. Immediately lower the temperature to 400 degrees F (200 degrees C), and bake for 10 minutes. Reduce the temperature to 350 degrees F (180 degrees C) and bake for a further 10-15 minutes until well browned and puffy. I'm back. Really, really back. Not gonna disappear like that again. I mean, I'm not promising anything but I have recipes to share now! Up until this point I had a blog writer's block, if there's such a phenomenon. I certainly had it. But look at this beauty! My mom made the cake and I made the cream. Okay, the cream had to be remade because I royally messed up for the 1st time. It landed in the trash. I so hate it when perfectly good ingredients are wasted. It's a waste of money and well, obviously a waste of food. Especially when you use good quality. So, learning from my mistakes I will share how not to repeat my clumsiness. This cake tastes phenomenal. Seriously. The base is a meringue and there are hazelnuts thrown in. Crispy and crunchy on the outside and fluffy and oh so soft on the inside. And about the cream. It's a bit more work than your average butter cream but oh em gee, it's so delicous! I put nutella inside just to bring a bit more hazelnutty flavor to it. So good. There is one con to this cake, though. Very sweet. And if you don't add enough sugar to the meringue, it will not have the same crispy consistency. But it's not badly too sweet. It's just a bit sweeter than I like normally my desserts. But very addictive. Whisk the egg whites until frothy, then add in the sugar. Wisk it until shiny and forms peaks. Then fold in the hazelnuts. Using a big plate as a drawing pattern, put the plate on a parchment paper, outline it with a pencil and cut it. You should have two paper circles as you will bake two meringue cakes. Place the parchment paper circles on 2 separate baking sheets and place the eggy cream on each of them. Put them in the oven for 10 minutes then reduce the temperature to 125C (255F) and bake for 1 and a half hour. Turn the oven off but let the cakes sit inside until the oven cools down completely. Whisk the egg yolks in a pot just a bit so it's smooth, then add the milk and sugar to it. Place it over medium heat and stir it until it's warm and the sugar is dissolved completely. Make sure to not bring it to a boil because the yolks can be lumpy. Strain the mixture so you won't have the egg yolk lumps. Then cool the mixture down. The mixture should not be warm at all, this is the point I messed it up because I thought lukewarm was already cool enough. No, it should be almost cold. Bring water to a boil in a smaller pot, place a bowl over it and melt the milk chocolate. When the milky mix is cool, then mix the butter until it's smooth and creamy. Add in the milk in 3 parts. Then comes the melted chocolate and the Nutella. The cream should be light but resemble to a butter cream texture. I'm on a health kick right now. I mean, it's more like going back to the healthy eating ways. I haven't realized how much I missed my old and good ways! You know the usuals... Using whole wheat flour, banning processed foods, skipping on the wine and so on. Now that I look back, no wonder I gained 5 pounds in a month! I was eating all the wrong foods! Like white bread! I stopped eating white bread when I was 14! What the hell was I thinking? That's right, I was not thinking at all. I let in to all the cravings. If you are in the same shoes, trust me! Do not let your cravings control your hands when it comes to chips, cookies or nutella. Because cravings are strong and forceful creatures. You can't see them but they can move hands and mouth and teeth and will make you gain weight if you don't pay attention! Just look at some of the yummy things that actually don't look that yummy but believe me, they were the most delicious meals EVER. Oh! Who's that?? :) Sneaky me, huh? But back to the recipe! It's for one person and it's so quick! Cook the rice in 2/3 cup water over very low heat until it's soft. About 10 minutes for me. Let it cool down. You shouldn't use warm rice for this recipe. Heat 1 Tbsp oil in a wok, add the white parts of the spring onion and garlic, saute for a few minutes, then add the carrots, bell pepper pieces and the chili. Cook over medium heat for 5 minutes. Season with a pinch of salt. Break apart your cold rice with a fork and add it to the wok. Fry it for a few minutes over high heat and add your sauces. Stir well and fry for about 4-5 minutes more. Sprinkle it with the green parts of the spring onion and cilantro. ps: You can add in chicken as well. You just fry it in oil and season it with salt and then continue with the original recipe! 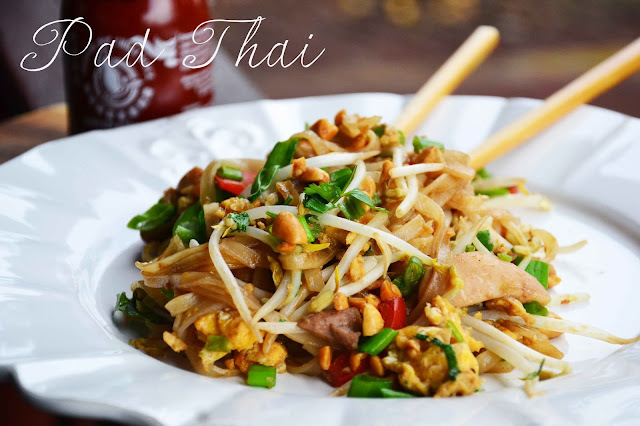 Remember the last time I made pad thai? No? Then, check it out! I used almost the same recipe now, the only difference I made is that I substituted the carrot to a red bell pepper and I added a whole bunch of cilantro on top! It doesn't only have a wonderful taste, it also gives a lot of health benefits to those who consume the herb. It is said that it may reduce blood sugar, it is antioxidant and very rich in magnesium and iron. Drain your noodles from the cold water and pour boiling water on it. Let it sit for 3 minutes and drain. The noodles should be al dente, definitely not too soft. Heat oil in a wok and add the chicken. Fry it for only a few minutes until the meat whitens. Season it with salt and pepper. Set it aside. In the same wok add 2 Tbsp oil and add garlic, the bell pepper pieces, chili powder, the white parts of the spring onion and stir until fragrant. Add tamarind juice or white vinegar and noodles. Turn the heat to medium and stir fry for a few minutes. Turn the heat down to low and move the noodles to one side of the wok so you have place to fry the eggs. Add the eggs and scramble. Add fish sauce,soy sauce, sugar, salt, peanuts, the sprouts and turn the heat up to high. Stir fry until thoroughly mixed. Sprinkle with the green parts of the spring onion and the chopped cilantro. But who knows what intense work and hunger will do to someone. Oh ya, like making me procrastinate once again. Oh well, you're welcome :) Because now you will have a recipe that you will want to cherish or even hide or keep it a secret because once others try this dish, they won't leave you alone until you give them the recipe. It's this good. Believe me. I mean, it's not even my recipe and I'm singing praises for it. Bring a big bowl of water to a boil. Add your pasta and 3 teaspoons of salt to it. Cook till al dente, about 8 minutes. Reserve some of the water for the sauce.